Most of the time when we hear about a sequel to a movie we loved but that happened a long time ago—like say 23 years in this case—it makes us sad and we assume that they’re going to screw up something we hold near and dear. However, one of these that we’re actually pretty stoked about, whether it happens or not, is Bill & Ted’s Excellent Adventure 3. The idea has been kicked around for a long time, and it sounds like they have a solid script, as well as all the important players involved (they, to be honest, seem even more excited than any of us), and star Keanu Reeves recently shed even more light on what this could look like, if it happens. We have to get the script in the right place. Chris and Ed have been working really hard over a couple of years to get the draft in the right place. What is the reason to make this movie besides nostalgia or the love of these characters. Where can they be in their life that can be a story that is worth telling or has something in it and is funny? They have that. It didn’t help that the first script that they brought in was probably budgeted at $150 million dollars. I don’t know if Bill & Ted carry that much weight. Part of the argument is that it’s not that popular internationally, that’s where so much of the funding for movies comes from these days. They’ve worked on the script and the budget, just trying to get the right script and then get the business side wrapped up, financiers and rights, all the show business stuff. [T]hey’re just like, “Dude, we have to write the song!” The future comes back and says if you don’t write the song by this certain time the universe is going to unravel and history and everything is going to change and dinosaurs are gonna walk the Earth. Jesus is playing baseball! All sorts of weird things start unraveling and wormholes are twisting. We have to kind of bring order back, and it’s connected into bringing our families together by writing a song. That better be a damn good song. 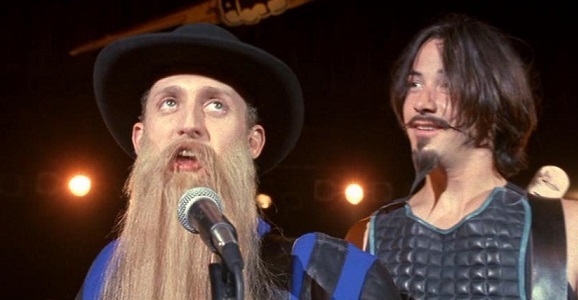 There’s a great scene where Bill and Ted are in jail and we’re seeing our future us’s and they’re all tatted and hard. They’re like, [tough sounding] “What’s up, dude? Hey dude. Hey guy.” “Stop calling me dude!” They want to beat up Bill and Ted because they’ve inherited the life that they f**ked up. They’re miserable and they hate Bill and Ted. That sounds like a damn fine time to us. There’s no timeline for when Bill & Ted 3 could possibly happen, if it happens, but with all of the people involved so enthusiastic about this, we hope it will go down eventually. 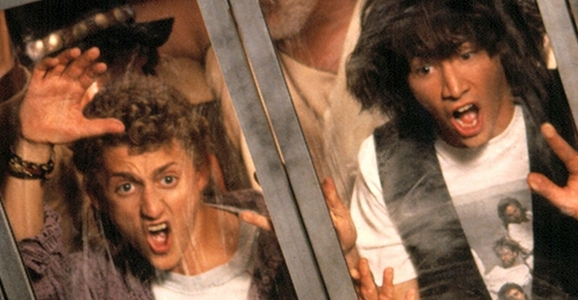 I’d say it’s a pretty safe bet that Bill & Ted 3 will be in the $35-$50 range.